The Happiest of Holidays to you all! There is a lot going on in The Village Doctor community this month! Please read on about food, faith, and... shopping! In the spirit of festive tables, and healthy diets, I'm delighted to again introduce you all to my friend and colleague, Dr. Jeanne Rosner, founder of SOUL Food Salon, whose mission is to educate and empower people to lead healthier lives. Jeanne and her team are again hosting a "food challenge" for 2019. If you are interested in learning more about the food challenge click here, or if you wish to simply subscribe to the weekly email announcing the ingredient of the week please click here! 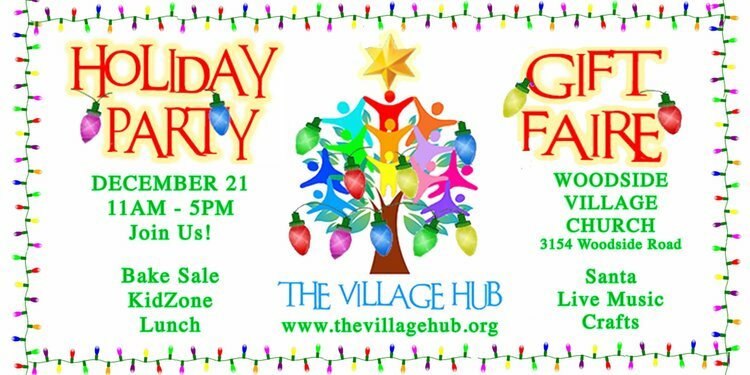 Let me also bring your attention to The Village Hub, in Woodside, who is hosting their annual Holiday Party and Gift Faire on December 21 from 11am to 5pm. Festivities include complimentary champagne for shoppers, a "FunZone" with cookie decorating, a bouncy house, Gypsy-Pixie Hair Sparkles, and once you're all decorated up, pictures with Santa! All rounded out with Holiday Carolers and the Wildcat Family Strings for your musical entertainment. Join us at The Village Hub at 3154 Woodside Road, home also of the Woodside Village Church. Learn more about the Gift Faire here and the Holiday Party here. As always, it is my pleasure having all of you be part of The Village Doctor practice and family.